Straw was once, after rods and twine, the most widely used material in basketry in Slovakia. Various products were woven out of it of which the most common were baskets, such as oval or round baskets for rising bread dough. Woven were also grain bins and beehives. 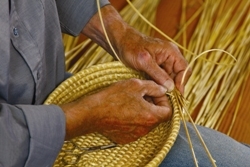 Basketry of straw is based on the traditional spiral technique. For basket weaving two materials are prepared – wicker and reeds, with which the straw is enwoven. Articles of straw were woven mostly for personal use but in some areas production was broadened to a range for sale. For traditional straw craftsmanship revival was ÚĽUV. One of those, whose collections of work belonged to ÚĽUV, was Jozef Moravčík from Prievidza. The simplicity and beauty of the material spoke to him. In the 20 years he dedicated to straw traditional craft, Moravčík created pieces of various sizes. His straw baskets (known as slamienky), both round and oval, were crafted with traditional technique from rye straw with careful attention to detail and precision. In 2012 Jozef Moravčík earned a Master's Degree of Artistic Production in work with straw – for maintaining the use of traditional materials. In April of 2013 ended ÚĽUV's 10 year collaboration with master Jozef Moravčík on account of his death.